OneNote 2016 won't go away, but it won't receive further improvements, either. 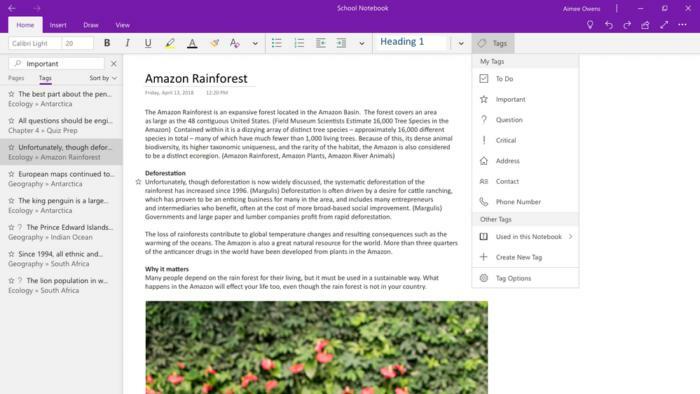 Microsoft has quietly worked to improve the basic OneNote app within Windows 10, and on Wednesday it received an unexpected show of support: The OneNote 2016 app for Office 365 will be put on hold, and the OneNote app already within Windows 10 will replace it within Office 2019. It’s a ringing endorsement for OneNote for Windows 10, whose UI overhaul in 2017 (above) migrated the pages and sections to the left-hand rail. Since then, OneNote for Windows 10 has added some of the top features of the Windows 10 app, including perhaps the best feature of the note-taking tool: audio that’s synced to your notes. 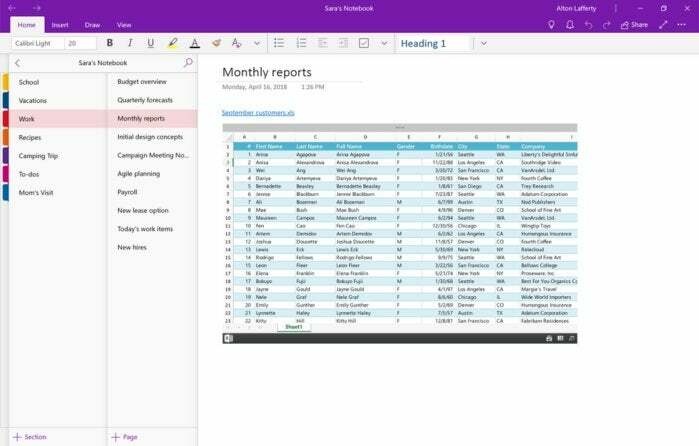 Microsoft said it plans to keep migrating features from one app to the other, including the ability to insert and search for tags, create page templates, as well as preview other Office files, right within OneNote. So what will happen to the existing version of OneNote, OneNote 2016? Microsoft executives said they’ll hold off on adding new features, but won’t discontinue the software, either. What this means: Though Microsoft has invested millions of dollars in its Office 365 apps, there’s a few basic, native apps within Windows 10 that reproduce most of the functionality that an average user needs: Mail, for example, can work just as well as Outlook in some situations. Personally, I migrated away from OneNote for Office to the native Windows 10 app some time ago, and never looked back—in part because my beloved audio-syncing feature would stop working unexpectedly, and that’s bad news for a reporter. The native app seems to be much more stable in that regard. Microsoft made the smart choice to continue migrating its best features from the Office 365 app over to the native application, satisfying its user base. Tags will migrate to the Windows 10 OneNote app in the coming months, Microsoft said. Microsoft’s OneNote for Windows 10 does look a bit more consumer-y than the Office 365 version, including sparkly ink effects and other fun features, including the ability to “read” equations and other inked words as text. Those features will be preserved, Microsoft said. Many, though—including the ink effects and a Researcher tool that pulls content from Bing to add to your notes—will continue to require an Office 365 subscription to work properly. Microsoft now believes strongly in recurring subscriptions that can be budgeted in, and will likely reserve its choicest features for the O365 subscribers. Microsoft said it also plans to bring the improved sync experience that powers the OneNote for Windows 10 app to its mobile platforms, allowing changes made to one file to sync within seconds to another. As always, Microsoft encouraged users to use the built-in Feedback Hub app within Windows 10 to provide requests, complaints, and other feedback. This story was updated at 11:25 to clarify that which apps are affected.